So, we made it home, without incident. I think I never drove slower. 🙂 We’ve survived the first night, pretty much intact. Surprisingly, Maya slept about 4 hours at a time, so we really only had to wake up twice last night to take care of her. Otherwise, she was a perfect angel. It seems that everything is really easier at home. Although we don’t have the nurses constantly preparing bottles and sterilizing everything for us, as long as we stay on top of it ourselves, and are prepared in advance, it works out well. Mommy is much more comfortable here, the swelling in her ankles has gone done, and I think even Maya likes it better here. Plus, Daddy gets to hug Mommy at night, finally, something that he missed quite alot. Just want to give everyone a heads-up on Maya and Mommy. Everything is fine, but of course, we’re worried about every tiny little thing. Maya has a bit of peeling skin on her chin and hands, but apparently that can happen with overdue babies. She’s having quite a bit of trouble breast feeding, but we just have to find the trick to get her going, I think. Especially once the milk starts coming in, it should ease up a bit. Svitlana gets very frustrated, though, when Maya’s screaming because she’s hungry, but won’t feed. We know she’s hungry, because she’ll drink tea from a bottle, but we really want her to start breast feeding soon. 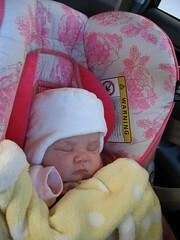 In any case, though, her weight drop since the birth is still normal, so nothing to worry about there. Here’s a link to the current photo set – we’ll add more as we go (Maya’s Photos). She’s sleeping soundly now, very well-behaved. Final Score: 1 Baby, 2 Happy Parents! So, we’re back at the hospital. Svitlana tried a Wehencocktail yesterday, and while she had a couple of contractions, it once again didn’t really stick. They now tried to induce again, with the same medicine as last time. That was a couple of hours ago, but she hasn’t noticed anything until now. 17:14: Slight contractions have started again, similar to last time. We’re taking yet another CTG, just keeping an eye on everything. We are also trying some homeopathic medicines to start the labor. We’d like to do everything possible, before we really give up and just do the C-Section. 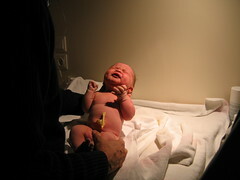 17:50: The midwife just did another checkup, and it really hasn’t progressed at all, unfortunately. Looks like we will have to do a C-Section after all. We have to talk to the doctor. 19:15: It’s set – we’re having a C-Section at 8:00PM. That’s in about 45 mins. So, after the CTG today, and a quick checkup, the Dr. let us know that Svitlana isn’t progressing as quickly as they would like, so we’ve decided to induce labor. We’re just home now to get all the stuff to bring with us, then we’ll be heading to the hospital to get started. I’ll try to keep you updated here, since we should have WiFi in the hospital, I should be able to post updates. We’re also bringing cameras and so on, so keep an eye here for updates. Till then! 17:02: Nothing to report yet. They gave the inducer at about 15:00, and now we just have to wait. More waiting. The staff are great so far, and everyone is very nice. Svitlana has a nice roommate to stay with (we took a double room for now), with a brand new baby boy. Very nice to have WiFi here, though. Informed all the moms and dads of what’s going on. Watched Look Who’s Talking. Svitlana is walking around, trying to get some exercise. 18:13: Had some food. Was actually really good. Topfenknödel with Zwetchkenröster. Svitlana wasn’t able to finish it all, so I ate the rest. Is it wrong to eat the dinner of a woman on the verge of going into labor? She’s started to have some cramps, so it seems like it’s starting to take effect. Watching Seinfeld. 20:26: This is going to take a while. Just had another consultation with the doctor – she says that it’s progressing, but administered another tablet to move it along. According to the midwife, it almost never starts with just one tablet. So now, she’s on the CTG again, to make sure everything stays ok. We’re definitely going to be here a while before it starts to get really interesting. I have a chair here beside the bed, where I expect to be sleeping tonight. Still watching Seinfeld. 22:54: Just finished a CTG again. Everything is fine so far. We’re gonna try to get some sleep.